HÀ NỘI — Shares advanced further on both local exchanges as investors eagerly anticipated some companies’ sale of more shares to reduce the State’s capital holdings, and by the impacts of the APEC event last week. The benchmark VN Index gained 1.28 per cent to close at 879.34 points. It has increased by a total of 5.5 per cent in the last seven sessions. On the Hà Nội Stock Exchange, the HNX Index added 0.39 per cent to end at 106.79 points, extending its growth for a fourth session with a total gain of 1.9 per cent. More than 283.7 million shares were traded on the southern bourse, worth VND13.4 trillion (US$597.3 million), while the northern market traded more than 59.2 million shares, worth VND725.3 billion. Market trading condition was negative as losing stocks outnumbered gaining ones by 284 to 184 on both local exchanges. The figures posted an increase of 47 per cent in trading volume and nearly 58 per cent in trading value compared to the average numbers of last week. The sharp rise of trading liquidity on Monday was attributed to foreign trading of dairy producer Vinamilk (VNM) shares. VNM shares rose by 6.2 per cent and have risen a total of 17 per cent after the last four sessions. More than 40.5 million shares of Vinamilk were traded on Monday via both put-through and order-matching methods, including more than 36 million shares purchased by foreign investors via put-through transactions. Foreign investors posted a net buy value of more than VND286 billion, a decrease of 81.8 per cent in value compared to Friday. Vinamilk is among five listed companies in which the State Capital Investment Corporation (SCIC) plans to offload the State’s ownership in 2017. The four others are Viet Nam Construction & Import-Export Corporation (VCG), Tiền Phong Plastic Co (NTP), Bình Minh Plastic Co (BMP) and IT group FPT Corp (FPT). VCG surged 8.3 per cent, NTP and BMP soared 10 per cent and 6.9 per cent, respectively, hitting their daily increase limits, and FPT jumped 3.4 per cent. Among the four firms, SCIC will organise a roadshow on November 16 to introduce VCG to potential investors in an attempt to sell 96.25 million shares or 21.8 per cent of the company capital. Investor confidence also improved after Vietnamese companies signed a total of $12 billion worth of contracts with US companies during the week-long APEC event. Truck dealer Hoàng Huy Investment Financial Services Co (TCH) on Sunday signed a $1.8 billion agreement with the US-based Navistar International Corporation to import 100,000 trucks between 2018 and 2027. The company shares hit their daily increase limit of 6.9 per cent. According to Bảo Việt Securities Company (BVSC), though the stock market showed strength on Monday with the rise of trading liquidity—which would support the market growth in the short term—losing stocks still dominated the market. 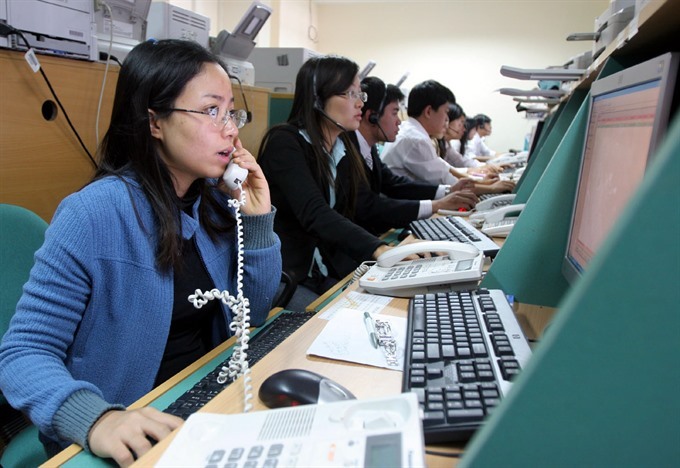 It proved investors were becoming more cautious and they tried to sell off the stocks to earn profits, on worries that the VN Index will retreat when it hits the level of 880 points, BVSC said in its daily report. If the benchmark index starts falling, it is expected to bounce back again when it reaches the range of 850-855 points, the company said. The Singapore-based automotive group Jardine Cycle and Carriage has acquired a 5.53 per cent stake in Viet Nam’s largest dairy producer Vinamilk through its wholly-owned unit Platinum Victory for $616.6 million in cash, the company said on Monday. The Singaporean firm bought Vinamilk’s shares from Viet Nam’s State Capital Investment Corporation (SCIC), which represents the Vietnamese Government to manage the State’s capital in the local companies. SCIC had previously sold off all of its 48.33 million shares, or a 3.33 per cent stake in Vinamilk, via an auction on the HCM Stock Exchange last Friday for $396 million, higher than expected. Vinamilk’s shares were transferred at VND186,000 each, 24 per cent higher than the initial asking price and 7 per cent higher than the price at closing time on November 10 trading session. After the latest deal, SCIC remains the largest shareholder in Vinamilk with 36 per cent ownership and retains its senior voting right in the company. The State-run firm is followed by Jardine Cycle and Carriage (5.5 per cent ownership) and another Singaporean firm, Fraser & Neave (5.4 per cent). Fraser & Neave, a subsidiary of Thai conglomerate TCC, purchased 5.4 per cent of Vinamilk shares from SCIC in December 2016. The sale came in under the expected 9 per cent the government originally planned to sell. JC&C, a subsidiary of Hong Kong-based conglomerate, has marked its presence in Vietnam for decades, with a 25 per cent stake in Truong Hai Automobile Joint Stock Company (Thaco), the largest car manufacturer in Vietnam, and 23 per cent in Hochiminh Stock Exchange-listed REE Corp (REE). The latest deal increases Jardine Cycle & Carriage (JC&C)’s exposure to the Vietnamese economy, and it remained open to making further such investments, the company added. “The taking of this interest in Vinamilk is in line with the JC&C group’s strategy of investing in market leading companies in Southeast Asia. In particular, it increases JC&C’s exposure to the Vietnam economy,” it said in the statement.